Where does morality stop and opinion begin? November 23, 2018, 10:53 a.m.
Should we leave the EU? Should we allow abortion? Should we abolish the royal family? YouGov asks Britons which are moral issues and which are matters of opinion. Earlier this year Labour MP Phil Wilson declared Brexit to be “a moral issue for politicians” while calling for a second referendum. To see if he was correct, YouGov asked Britons their opinion on 21 issues: are they matters of opinion or morality? We discovered that Brexit may be a moral issue for Mr Wilson but it certainly isn’t seen as one by the British public. In fact, only 19% of Britons see it that way, making it third least likely on our list to be seen as a moral matter. For each issue we put opposing stances to the public and asked whether or not the choice was a matter of morality or simply represented different points of view. Only two of the scenarios we put to the public were considered to be moral issues by the majority of Britons: whether or not torture should be allowed on terrorism suspects (59%) and capital punishment (52%). 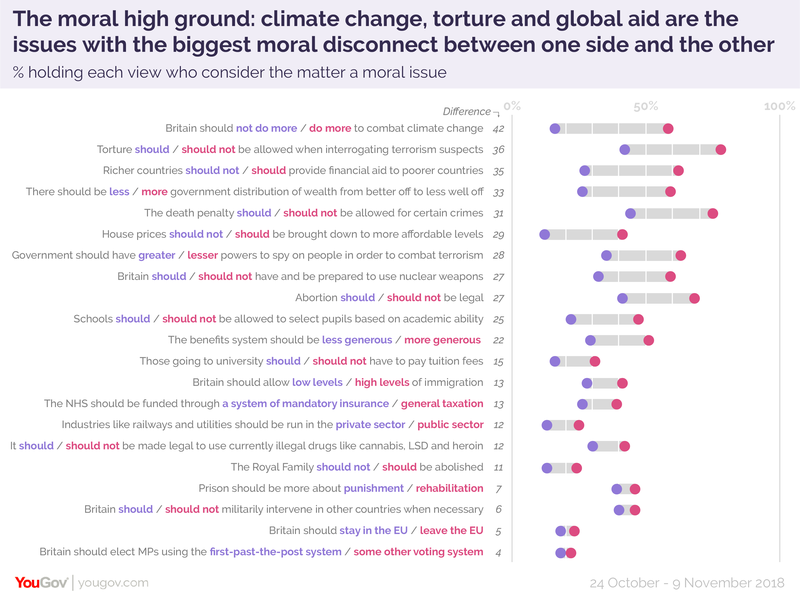 A further three were seen as moral issues by a plurality of Brits: providing financial aid to poorer countries (45%), the level to which government redistributes wealth (44%) and whether we should do more to combat climate change (43%). By contrast, the issues that Britons were least likely to see as moral issues were whether or not to abolish the royal family (14%), whether to elect MPs by first-past-the-post or some other system (15%), whether or not Britain should leave the EU (19%) and nationalising industry (19%). Nevertheless, this does mean that sizeable minorities of the British public see many of the issues as being matters of morality. The problem with political issues being cast in moral terms is that it makes debate and compromise impossible: how do you debate with someone whose view is immoral? It also leads people to see political opponents not simply as individuals with different ways of looking at the world, but as enemies. The results also show a moral disconnect between supporters on each side of an argument, the largest of which can be found on climate change. Those Britons who think we should be doing more to combat climate change are far more likely to consider it a moral issue than those who do not (58% vs 16%). Similarly, those who are anti-torture are more likely to see the issue in moral terms than those who are pro (78% vs 42%). Brexit again came close to the bottom of the pile, being the issue with the second smallest moral division between those with opposing views. Only 23% of those who want Britain to stay in the EU consider it a moral issue, compared to 18% of those who think Britain should leave.